From December 5-7th, Sydney Olympic Park is the place to be if you’re a motor sports lover. Over three days, the V8 Supercars Sydney NRMA 500 will be racing for the grand final. From Ford to Nissan, Volvo and Erebus, they all go nose to nose at this adrenaline Championship event. Marcos Ambrose has won the V8 Supercars twice and will be back for a new round so all Marcos fans, you’re in for a celebrity treat. This is his first return from the U.S. with a new generation of V8 supercars. Not just for boys-who-love-toys, this event is for the whole family as there will be carnival rides, Disney Fun Zone, Car Shows and a new Super Top Entertainment hub. Talk about a summer of speed, just before the holidays kick in! Also anyone reading this with under 14 year olds, you have the added bonus of your munchkins receiving free general admission, with a paying adult. You can also watch history in the making as a new champion is crowned in this Park, the same venue that hosted the 2000 Olympics. On a side note, did you know that it took four years for the Sydney NRMA 500 to have a repeat race winner, Craig Lowndes, winning in 2011 and 2012? Past other winners include Jamie Wincup, Jonathon Webb and James Courtney. This year’s race will spin around the Park complex and the two team drivers will be subject to a multitude of bumps, fast & slow corners and camber changes over 3.4km. With a top speed of 248km/h, you are more advised to video the competition because if you use a smartphone camera, by the time you click, the cars will have sped by and no one will believe you were ever there! The ticket prices vary from Grandstand to Trackside, Fanstands, Paddock Passes and the Engine Room. For a 3 day Platinum Grandstand tickets, pre door prices range $280 to $690 AUD, depending on whether you buy an adult or family pass. Trackside passes range $25 to $115 pre door so look through the ticket options to assess your budget. With the adrenaline pumping and the love of all things fast, what better way to wind down than stay at Sydney’s most affordable boutique hotel. You can settle back and get a second rush of hype, viewing the stunning Harbour as the sun goes down. Need a preview? 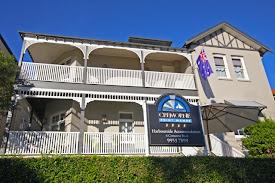 Check Cremorne Point Manor’s home page video to see what you’ll see, once you stay with us. Pretty sensational, right?